Fiji's win over Samoa saw them crowned World Rugby Pacific Nations Cup 2017 champions and confirmed Tonga's qualification for Rugby World Cup 2019 as the Oceania 2 qualifier. Henry Seniloli scored a hat-trick as Fiji defied the rain that fell in the second half at Apia Park to beat their hosts Samoa 38-16 and successfully defend their World Rugby Pacific Nations Cup title. Fiji had trailed Samoa 16-14 at half-time, but by the final whistle had outscored their hosts by five tries to one to complete the Rugby World Cup 2019 qualification process which spanned both the 2016 and 2017 editions of the Pacific Nations Cup, unbeaten. 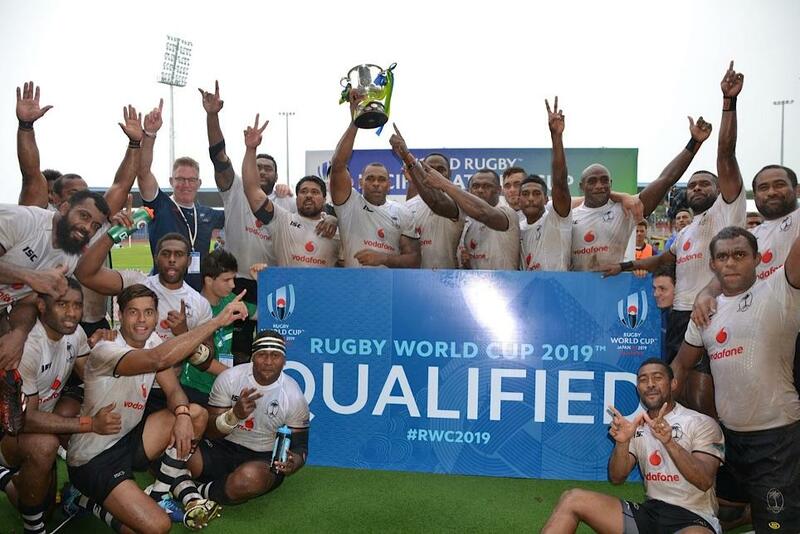 The Fijians had already confirmed their place at RWC 2019 in Japan as the Oceania 1 qualifier with a narrow victory over Tonga last weekend, taking their place in Pool D alongside Australia, Wales, Georgia and the Americas 2 qualifier (Canada or Uruguay). Samoa needed to get something out of the match if they were to claim the Oceania 2 spot, but their failure to do so means that Tonga instead complete the Pool C line-up with England, France, Argentina and USA for Japan 2019. The Samoans, who finished a point behind Tonga in the standings across the two competitions, must now wait to learn the identity of the European team they will face next year to determine the Play-off Winner qualifier in Pool A. If Samoa fail to take that route – by beating the winner of Czech Republic or Portugal versus the second-place team in the 2018 Rugby Europe Championship (excluding Georgia, who have already qualified) – they will be pitched into the global repechage tournament. Fiji made the better start at Apia Park and took an early lead through a converted try for scrum-half Seniloli. However, Samoa, with the breeze at their backs, fought back and some enterprising play from a quick tap penalty saw captain David Lemi score a try in the left corner. Tusi Pisi’s conversion levelled the scores, but Fiji responded with a wonderful counter-attack with full-back Timoci Nagusa prominent and Senioli crossed for his second try of the match. Once again Samoa pressed and the pressure caused ill-discipline from Fiji, allowing fly-half Pisi to kick three penalties to give the hosts a slender 16-14 lead at the break. The rain started to fall at half-time, but it didn’t faze Fiji who unleashed a 15-man game that stretched Samoa wide. The tactics worked and in the damp conditions Fiji scored three more tries through Senioli, centre Jale Vatubua and replacement Apisalome Ratuniyarawa. Fiji fly-half Ben Volavola was immaculate with the boot, kicking five conversions and a penalty for a personal haul of 13 points in the victory. “It was a great win and I think our bench was great and it showed in the second half. We were too narrow in the first half and we gave away penalties that kept Samoa in the game,” said Fiji coach John McKee. “We are proud to have defended our PNC title. It is also our fourth test win in a row and I am told that is a record for Fiji. “Of course we have also qualified for RWC 2019 and we will now focus on that. This is a talented group and we have some younger talent emerging also. I believe this squad can improve further and our aim will be to make the quarter-finals in 2019. Samoa coach Alama Ieremia was inevitably disappointed with the result, which will see his side slip one place to 16th when the World Rugby Rankings update at 12 noon on Monday, their lowest position since the rankings were introduced in 2003. “We had a good first half but we knew we had to get a lead as we had the wind in the first half. We went into the break ahead but we made too many errors in the second half and Fiji capitalised on them. Fiji deserved the victory and we congratulate them. “We really wanted to win for the country and the boys tried really hard. I guess it is a painful lesson but the young squad will hopefully learn from it and we can take the experience forward as we do have a second chance at RWC qualification. There is one stage of Rugby World Cup 2019 qualification remaining in the region with the Cook Islands to face Tahiti in the Oceania Rugby Cup on 4 August. The winner will face the Asia Rugby Championship 2018 winner for a place in repechage tournament.